Apple didn’t kick off this year’s Worldwide Developer Conference with updated stats about the App Store — but it didn’t leave them out completely. More than one hour into the presentation, the company revealed that there are now 1.5 million apps in the App Store, putting it past the number of Android apps in Google Play. 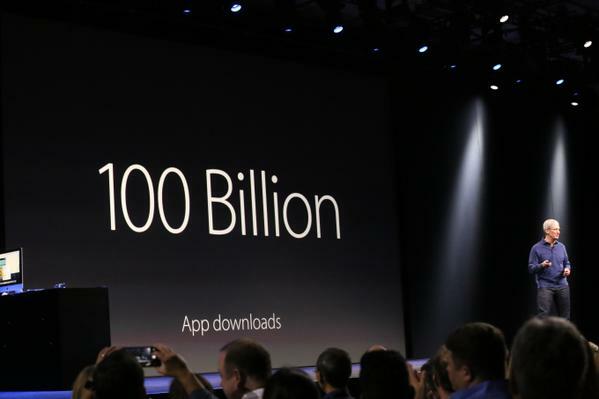 Apple also said that it’s passed the 100 billion mark for app downloads, and that $30 billion has been paid out to developers to date. “We could not be more proud of the work that you’re doing,” CEO Tim Cook told the audience. And yet, growth appears to be slowing. As pointed out by Andreessen Horowitz partner Benedict Evans, the $10 billion Apple paid out in the last 12 months is the same figure as the year before. While Apple doesn’t rely on these services as its primary revenue generator — it’s primarily a harware business — apps and other services on the services are a key way of keeping consumers and businesses interested in owning and using the devices. This could be one reason why Apple is looking to new services like News and its music operations: to offset the slowing growth in the now very-big App Store. A video took the audience through yet more developments on the app front: there are now 850 apps downloaded every second, and the average person has 119 apps. Those numbers are one reason we need better deep-linked search to sift through them).